C. S. Burrus and T. W. Parks, ``Time domain design of recursive digital filters,'' IEEE Transactions on Audio and Electroacoustics, vol. 18, pp. 137-141, June 1970. Englewood Cliffs, NJ: Prentice-Hall, 1994. J. A. Cadzow, ``High performance spectral estimation--a new ARMA method,'' IEEE Transactions on Acoustics, Speech, Signal Processing, vol. ASSP-28, pp. 524-529, Oct. 1980. P. R. Cook, ``Non-linear periodic prediction for on-line identification of oscillator characteristics in woodwind instruments,'' in Proceedings of the 1991 International Computer Music Conference, Montreal, pp. 157-160, Computer Music Association, 1991. Englewood Cliffs, NJ: Prentice-Hall, 1974. M. Dolson, ``The phase vocoder: A tutorial,'' Computer Music Journal, vol. 10, no. 4, pp. 14-27, 1986. New York: IEEE Press, 1979. A. Fettweis, ``Wave digital filters: Theory and practice,'' Proceedings of the IEEE, vol. 74, pp. 270-327, Feb. 1986. Reprinted in [74, pp. 388-404]. Stroudsburg, Penn. : Dowden, Hutchinson, and Ross, Inc., 1973. Englewood Cliffs, NJ: Prentice-Hall, 1998. Baltimore: The Johns Hopkins University Press, 1989. New York: Academic Press, 1977. 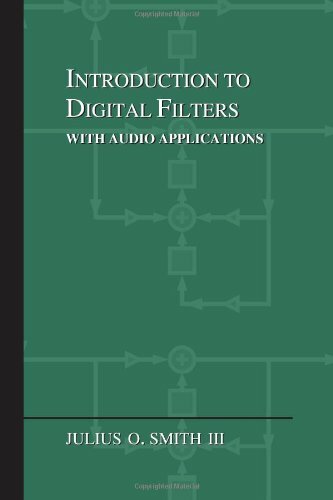 A. H. Gray and J. D. Markel, ``A normalized digital filter structure,'' IEEE Transactions on Acoustics, Speech, Signal Processing, vol. ASSP-23, pp. 268-277, June 1975. New York: John Wiley and Sons, Inc., 2000. New York: Springer Verlag, 1976. Englewood Cliffs, NJ: Prentice-Hall, 1980. Englewood Cliffs, NJ: Prentice-Hall, Apr. 2000. J. B. Keller, ``Bowing of violin strings,'' Comm. Pure Applied Math., vol. 6, pp. 483-495, 1953. D. Klatt, ``Software for a cascade/parallel formant synthesizer,'' Journal of the Acoustical Society of America, vol. 67, pp. 13-33, 1980. M. Lang, ``Allpass filter design and applications,'' IEEE Transactions on Signal Processing, vol. 46, no. 9, pp. 2505-2514, 1998. M. Lang and T. I. Laakso, ``Simple and robust method for the design of allpass filters using least-squares phase error criterion,'' IEEE Transactions on Circuits and Systems--I: Fundamental Theory and Applications, vol. 41, no. 1, pp. 40-48, 1994. Cambridge University Press, Jan. 1958. See also the function stmcb() in the Matlab Signal Processing Toolbox. Cambridge, MA: MIT Press, 1983. J. Makhoul, ``Linear prediction: A tutorial review,'' Proceedings of the IEEE, vol. 63, pp. 561-580, Apr. 1975. S. J. Mason, ``Feedback theory--some properties of signal flow graphs,'' Proceedings of the IRE, vol. 41, pp. 1144-1156, Sept. 1953. S. J. Mason, ``Feedback theory--further properties of signal flow graphs,'' Proceedings of the IRE, vol. 44, pp. 920-926, July 1956.
available online, with sound examples, at http://ccrma.stanford.edu/~jos/smac03maxjos/. available at CCRMA (see http://ccrma.stanford.edu/overview/publications.html). J. A. Moorer, ``The use of the phase vocoder in computer music applications,'' Journal of the Audio Engineering Society, vol. 26, pp. 42-45, Jan./Feb. 1978. 1st edition 1936, last author's edition 1948, ASA edition 1981. New York: Springer Verlag, 1982. Englewood Cliffs, NJ: Prentice-Hall, 1969. Englewood Cliffs, NJ: Prentice-Hall, 1989. Englewood Cliffs, NJ: Prentice-Hall, 1975. G. R. Reddy and M. N. S. Swamy, ``Digital all-pass filter design through discrete hilbert transform,'' in Proceedings of the International Conference on Acoustics, Speech, and Signal Processing, Albuquerque, 1998. Cambridge, MA: MIT Press, 1989. H. Schmid, ``Circuit transposition using signal-flow graphs,'' in Proceedings of the International Symposium Circuits and Systems (ISCAS-2002), Phoenix, AZ, vol. 2, (New York), pp. 25-28, IEEE Press, May 2002. Reprinted in [74, pp. 352-366]. CCRMA Technical Report STAN-M-14, http://ccrma.stanford.edu/STANM/STANM/stanm14/. (out of print). Book reprint available from ICMA at http://www.computermusic.org/. Original version available as Stanford CCRMA Tech. Report STAN-M-20, April 1985. A shortened version appears in . CCRMA Technical Report STAN-M-39, http://ccrma.stanford.edu/STANM/stanm39/. J. O. Smith, ``Principles of digital waveguide models of musical instruments,'' in Applications of Digital Signal Processing to Audio and Acoustics (M. Kahrs and K. Brandenburg, eds. ), pp. 417-466, Boston/Dordrecht/London: Kluwer Academic Publishers, 1998.
paper: http://ccrma.stanford.edu/realsimple/faust_strings/faust_strings.pdf, presentation overheads: http://ccrma.stanford.edu/~jos/pdf/LAC2008-jos.pdf, supporting website: http://ccrma.stanford.edu/realsimple/faust_strings/. J. O. Smith and J. S. Abel, ``Bark and ERB bilinear transforms,'' IEEE Transactions on Speech and Audio Processing, pp. 697-708, Nov. 1999. J. O. Smith and J. B. Angell, ``A constant-gain digital resonator tuned by a single coefficient,'' Computer Music Journal, vol. 6, no. 4, pp. 36-40, 1982.
expanded tutorial and associated free software available at the Digital Audio Resampling Home Page: http://ccrma.stanford.edu/~jos/resample/. A. S. Spanias, ``Speech coding: A tutorial review,'' Proceedings of the IEEE, vol. 82, Oct. 1994. K. Steiglitz, ``A note on constant-gain digital resonators,'' Computer Music Journal, vol. 18, no. 4, pp. 8-10, 1994. Pacific Grove, CA: Wadsworth and Brooks, 1989. T. Tolonen, V. Välimäki, and M. Karjalainen, ``Modeling of tension modulation nonlinearity in plucked strings,'' IEEE Transactions on Speech and Audio Processing, vol. SAP-8, pp. 300-310, May 2000. S. A. Van Duyne and J. O. Smith, ``Implementation of a variable pick-up point on a waveguide string model with FM/AM applications,'' in Proceedings of the 1992 International Computer Music Conference, San Jose, pp. 154-157, Computer Music Association, 1992. B. Yegnanarayana, ``Design of recursive group-delay filters by autoregressive modeling,'' IEEE Transactions on Acoustics, Speech, Signal Processing, vol. 30, pp. 632-637, Aug. 1982. New York: John Wiley and Sons, Inc., 1999.